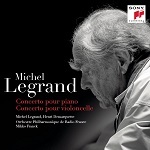 As recently as last September, film/theater composer Michel Legrand was in Paris finalizing and recording two new concert works and explaining to interviewers, "My training with Nadia Boulanger at the Conservatory opened to me all possible musical paths and I have pursued most of them; but for a long time I have been dreaming of one day writing in a classic concerto form." By his 80s and less active in film work, he had already done a harp concerto and a cello concerto from 2013-4. Now on the music stand was a piece for piano and orchestra with himself as soloist. 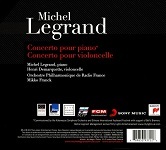 This 2016 piano concerto recorded here on a Sony/France Special Products CD with the Orchestre Philharmonique de Radio France (Nikko Franck conducting) is a disciplined essay in runaway chromatics (if that's not a contradiction). Its first movement is in the form of a tense chase: spinning chromatic piano figures against an agitated string backdrop. And except for a passage of rather regal piano chords, the whole movement is in constant motion like that, only occasionally touching down on a key signature before dashing off again into more of those illusive chromatic runs. The calm second movement does establish an opening key of F Major and is more at ease, free-flowing with ideas and offering a broader melody that seems to repent the angular tonality we've been hearing, even seeking some diatonic relief. But it soon surprises us, offering resolutions but in a distant key, the sort of prank that Prokofiev used to pull at the end of his neo-classical lines. Obviously, we've long since lost that earlier F Major foundation and we return to unanchored chromatics which are the concerto's true dialect. The third movement works best, opening with an atonal piano statement leading to a rhythmic stomping figure in the orchestra, quasi Stravinsky. There are some tricky exchanges between solo piano and solo bassoon, then solo flute, trombone, horn, tuba, respectively. The string section introduces the movement's main dramatic material for the full ensemble to take up. This is the heart of the concerto and climbs up into a big final tune built on small chromatic cells, of course, and on thirds but ultimately settling into the triumphant key of G Major. A virtuoso piano display sets-up the climax for applause. In fairness, no single hearing like this is enough to judge the solidarity of the work. First impressions can't tell if the opening movement was built on a structure that truly connects and disciplines all those chromatic runs -- or if the second movement's melody is compositionally related to the third's. Music of this ambitiousness deserves more time. While Legrand's piano concerto was composed on joint commission from a Midwest U.S. keyboard festival and the Kalamazoo Symphony Orchestra, this CD's second work, the cello concerto, was composed as an indirect kind of memorial for a friend of the cello soloist Michel Demarquette. As recorded here, it shows itself to be an outright romantic work in five movements wherein the cellist plays almost constantly in simple singing lines (when not navigating some sforzando transition sequences). Legrand's integration of the soloist with the orchestral textures is especially fluent and natural here, leaving the listener to deal directly with the melodic content. In the first movement, that melody is dreamy and full of sighs, nostalgic over some past memory. It's a youthful reverie from the elderly Legrand (I can't imagine old Rostropovich's cello doing it) but here the young Demarquette understands it well. The sentiments are vague and pastel, lured off into a harmonic passage that Legrand-specialists might recognize for its similarity to the love theme from his rejected score to the film ROBIN AND MARIAN (1976) and, sure enough, the scoring goes off into a vivace passage that mimics the swordfight music from that same film. Anyway, the movement ends with a sly wink toward the whole topic of nostalgia: a super-high last note tweaked on the cello. Perhaps it's a warning to not live in the past. And yet the second movement continues the nostalgic mood regardless – a quiet modal cello song made out of 4ths and 6ths with a soft orchestral accompaniment that tilts back and forth between sweet and tart. Only a quick third movement with its march meter succeeds in waking the cello to the here-and-now. Then, astonishingly, Legrand directs that the conductor of this music should actually come down off the podium and go to the piano (which has been waiting there on stage, unexplained) to strike up a personal duet with the cello and this becomes the fourth movement: a chromatic waltz! Strategically, this feels as though the musicians were taking a café break in the middle of a rehearsal; but miraculously and musically it seems quite natural and "right" as somehow part of the whole dreamy evening. It only lasts three minutes, though, and then the conductor resumes his/her post and everyone addresses themselves to the calm, wandering romanza finale – sung in the upper midrange of the cello voice, embedded in the by-now-familiar warm orchestral wrap. Two minutes before the end, everyone pauses: the cello meditates - its last notes blend into a hushed conclusion from the string section and it all fades into a mist. Nostalgia, of course, is all that's left. These are only first impressions, though, and we should be careful not to defer to this cello concerto just because of its charms, its obviously singing lines, or that daydreaming quality. Certainly the piano concerto's more ironic attacca mode deserves equal audition consideration. Until a balanced critique can prevail, let's just say that, in the end, it's inspiring that Legrand took on the task of concert music at all, desiring to be self-expressive after so many years of voicing other peoples films. And it's a tribute to him as an artist that his sound here is of a piece with his cinematic music – proof that he was always writing sincerely and personally. Whether or not these two concertos would please an audience and impress an orchestra without the celebrity composer himself in attendance is a mute point for now. The present CD deserves its hour on stage and more than one hearing. Recording and performance are first rate, though the English translation of the booklet text by Sony France is oddly awkward. This album is available from Amazon.co.uk, or Amazon.com.